Charming early chapter mystery book of less than fifty pages that is perfect for the beginning reader. Jenna bemoans the fact that her Nanna has moved from a bustling Australian city to a quiet house on Wattle Drive. Well, actually not that quiet, Nanna has adopted several pets: Oscar a large orange cat, Goliath, a large Great Dane, Cleo, a black and white cat, Albert, a python snake, and Polly, a chatterbox parrot, who enjoys watching police shows. One night while watching TV, Nanna screams with joy when she finds out that she has just won the lottery. 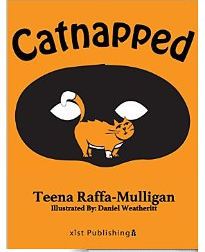 Nanna quickly decides that after setting some money aside for Jenna’s education and a trip to Disneyland; she will use the rest to take her friend Alice to the Sydney Opera House, but give the bulk of the money to build a special home for cats that nobody wants. Cass Snatchit and her lazy teenage brother Jack read of Nanna’s good fortune in the newspaper. They live in a run-down trailer and quickly decide that they will kidnap Nanna’s cat and demand a large sum of money for ransom. The author details their plans to spy on her and break into her house. Will they succeed in their plan to swindle Nanna and foil her generous plan for the lotto winnings? The six chapters are short and the text is easy to read and conversational. Characters are fun, and the black and white pencil illustrations are charming. I do think the illustrations might have been more effective if they were larger and in color. This book has lots of elements a child age six to nine will enjoy: animals, the good guys and the bad guys, and a touch of humor. Recommended as an independent reader or read aloud at home, in the classroom or for siblings to share with one another. Sounds like a fun read! Thanks for sharing on Booknificent Thursday!